To Canadians, the thought of pea soup—that solid staple of habitant fame—evokes warm memories of winter lunches, a possible recanting of an iconic commercial jingle and jokes about what it looks like in the can (we’ll just say it’s yellowish-green and stodgy). But who knew that the Quebec pantry basic had its roots in the voyageur trading routes? 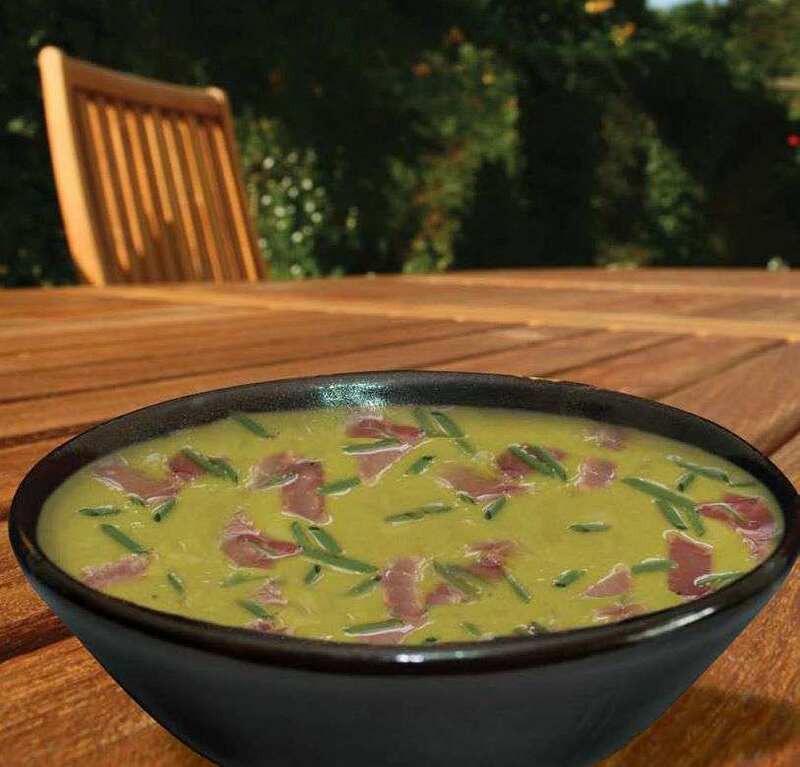 The “Pork-eaters,” fur traders who paddled from Montreal through the Great Lakes en route to the Grande Portage, ate a soupy mixture of split peas and pork—a direct ancestor of the modernized and finessed version of split pea soup made with ham or bacon fat. David Sproule, natural heritage education specialist for Ontario Parks, says that the stewpot would be carried in the canoe along with the basic ingredients. At each stop, the pot would be heated. The peas were grown at trading posts like Detroit and Sault Ste. Marie, making restocking possible. While the voyageur version may not have been the most savoury of meals, especially after many days in a canoe, split peas are an excellent source of both protein and fibre, making them a satisfying one-pot meal. and put into the fire. The term bannock is derived from the Scots’ version of bannock, which is a simple unleavened bread with oatmeal. The introduction of a leavening agent like baking powder may have been thanks to the pioneers. Local herbs, berries or dried fruit are often tossed in for flavour. In fact Outpost’s publisher Matt Robinson throws raisins into his version, and swears that almost everything tastes better out on the frozen land. Something that the voyageurs knew all too well. This is such an easy and deliciously filling soup, you may want to double the recipe and freeze some for a rainy or snowy day. Be forewarned that leftover soup will become strangely solidified, and you will need to add a bit of extra water to thin it out before reheating. Use a pot that is tall rather than wide to ensure that the ham hock is covered by the cooking liquid, otherwise it will not soften fully—though if this is the case, you can simply slice the ham. Cover the split peas with cold water and set aside to soak. Heat the oil in a heavybottomed pot over medium heat. Add carrots, celery and onion and sauté for 10 minutes, stirring occasionally, until softened and lightly golden. Add garlic and sauté for 1 minute longer. Add water, drained peas, ham hock, bay leaf and marjoram and bring to a boil. Cover pot, turn heat to low, and cook for 1 hour and 10 minutes or until peas have completely broken down and ham is soft enough to pull off the bone. Carefully remove ham hock, discard skin and bone, shred meat and return to pot. The reason bannock makes such great campfire fare is that it’s incredibly simple to make and, unsurprisingly, you can make an even more delicious version in the comfort of your own home (your oven being a little easier to control than a frying pan balanced over embers). Bacon fat or lard were the traditional choices for fat in bannock, and bacon fat certainly does give the bread a tasty flavour, but you can substitute butter if you prefer. Combine flour, baking powder and salt in a bowl and mix with a fork. Cut in fat with your fingers or a pastry blender until it is size of small peas. Add crumbled bacon and stir to distribute in flour mixture. Knead dough into a smooth ball and pat into a circle about 1 inch thick. Place on a parchment-lined baking sheet and brush lightly with milk. Bake bannock in the lower third of the oven for 30 minutes or until bannock is evenly browned and cooked through.